You might view sitting quietly and focusing as a waste of time -- after all, you could be burning calories, completing chores or earning the big bucks at your job. But meditation can make you more effective at doing all of these activities and improve your overall quality of life. Let go of the idea that meditation is only for ascetics or new-age yogis. The American Heart Association advocates a regular meditation practice to help lower stress and your risk of cardiovascular disease. You'll notice as you sit quietly that your body calms and your heart rate lowers. A lower heart rate is usually an indication of a more relaxed state of being. In 2004, a study published in “Psychosomatic Medicine” found that just a 10-minute session performed every day for three months resulted in lower blood pressure and daily heart rate in middle-school-aged youth. A later study, published in the June 2008 issue of “Applied Psychophysiology and Biofeedback” studied the effects of Hatha yoga meditation techniques on cardiorespiratory and metabolic intensity. The Brazilian researchers found that the participants’ heart rates were notably reduced during meditation when compared to heart rates at rest. Reduced heart rate can be a sign of reduced stress. When your heart beats more slowly, it pumps more blood with each beat – making it more efficient. An efficient heart experiences less strain and is less likely to suffer a heart attack. Why meditation lowers your heart rate isn't completely clear. It may be because it activates the parasympathetic nervous system, which is responsible for a lower heart rate, improved blood flow, enhanced digestion and slower breathing, as opposed to the sympathetic nervous system, which stimulates the "fight-or-flight" response in humans. The parasympathetic nervous system is also responsible for reduced blood pressure, another happy side effect of meditation, explains a meta-analysis published in a 2007 issue of "Evidence Report/Technology Assessment." Meditation may also affect the way in which your brain functions, which, in turn, affects body function -- including the rate at which your heart beats. Meditation has its origins in Eastern religious and spiritual traditions, but it can be adapted to a Western mindset. Many types of meditation exist -- some of which may appeal to you more than others. All you need is a quiet place and the ability to focus your attention. You'll need to be in a comfortable position so you can center your attention on a sound, your breath, an image, a mantra or an object. What type of meditation you choose is of little importance -- relaxing and giving your brain a vacation from the daily grind of work, home and society is what makes meditation valuable to lowering your heart rate and to improving your health. Dr. Dean Ornish, in his book, "Reversing Heart Disease," advocates starting with as little as five minutes, twice per day and working up to as long as 30 minutes for these two sessions. 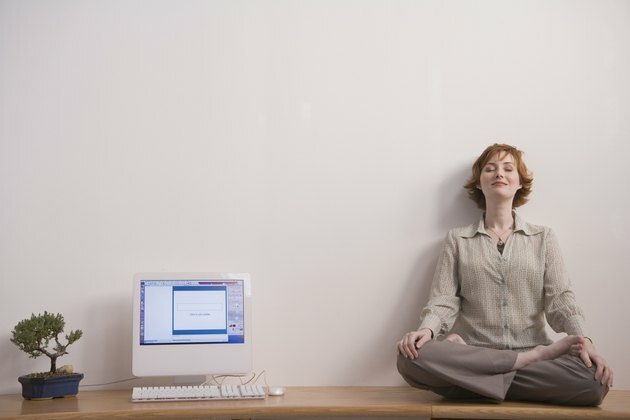 Evidence Report/Technology Assessment: Meditation Practices for Health: State of the Research. ASMR: Is the Solution to Your Anxiety in This Weird YouTube Trend? Can Meditation Cause Lightheadedness Afterwards?